My choreography is drawn from　Butoh　舞踏, a form of Japanese avant-garde dance theatre. Butoh emerged from the post war chaos in Japan in the late 1950s when the country grappled with the clash between new Western technology and traditional Japanese values. Butoh became a new form of expression, neither an imitation of western culture nor a traditional Japanese cultural practice. MANJUSAKA is a fragrant flower in the amaryllis family that blooms at the equinox when the dead and living are believed to converge. 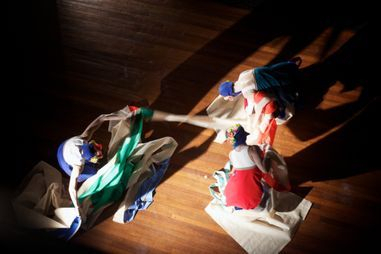 Inspired by the Japanese ancestor worship MANJUSAKA explores immortal world through Butoh dance, LED lights and sound-scape. MANJUSAKA is an evocative collage, a fusion of East and West, contemporary and traditional. Hyakki Yakou literally translates to a night walk of a hundred demons. In 17century Japan objects were believed to be given lives after nearly serving 100 years and the demons were the spirits of deserted objects. 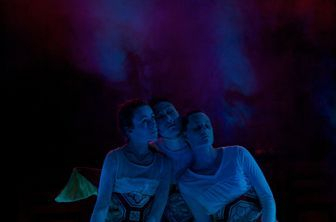 The piece incorporated choreography, light, sound, costume and guided viewing within the architecture. HYAKKI YAKOU examined a visual aesthetic with a sensory presence. ‘Beyond the Circle’ is a durational dance piece. Connecting the three circles in three locations through the journey of the three dancers. Location 1 - construction circle - the beach. Location 2 - permanent circle - Stade Open Space. Location 3 - animating circle - Stade Hall.